Laguna Del Campo: Gianna Perez, age 6, of Servilleta caught a 22-inch rainbow trout Oct.14. She was using worms. 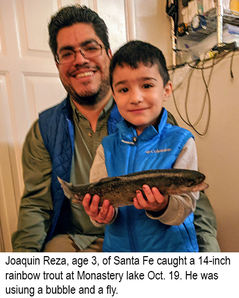 Monastery Lake: Joaquin Reza, age 3, of Santa Fe caught a 14-inch rainbow trout Oct.19. He was using a bubble and a fly. Julia Romero, age 10, of Santa Fe caught her first fish, a 13-inch rainbow, Oct. 21. She was using a fly under a bubble. 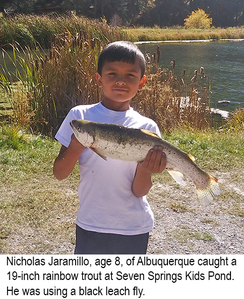 Seven Springs Brood Pond: Nicholas Jaramillo, age 8, of Albuquerque caught a 19-inch rainbow trout Oct. 20. He was fly fishing and using a black leech. San Juan River: Kymber Boggs, age 9, of Roswell caught and released a 16-inch rainbow trout Oct. 19. She was fly fishing the lower flats with her dad and using a size 26 black midge. Ute Lake: Laura Elkins of Amarillo, Texas caught and released a 4.72-pound largemouth bass Oct. 21. Eagle Nest Lake: Debbie and Ronnie Walker of Amarillo, Texas caught a 20-inch, a 19.5-inch and an 18-inch rainbow trout Oct. 13. They were using PowerBait. 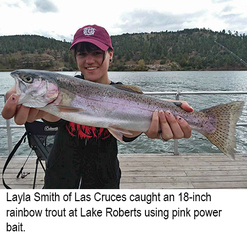 Lake Roberts: Layla Smith, age 18, of Las Cruces caught an 18-inch rainbow trout Oct. 13. She was using pink PowerBait. Charette Lakes: Closes for the season October 31. Cimarron River: Stream flow near the town of Cimarron on Monday morning was 16.1 cfs. Fishing was good using small streamers, copper John Barrs, San Juan worms, Fire Balls and worms for trout. Fishing at the Gravel Pit Lakes was fair to good using PowerBait and Fire Balls for trout. Clayton Lake: Fishing was good using worms, PowerBait and Fire Balls for trout. Fishing was fair to good using crank baits, worms and spinnerbaits for small bass. Fishing was fair using worms and liver for catfish. The lake closes for the season October 31. Conchas Lake: Fishing was fair to good using crank baits, senkos, curly tail grubs, spoons and tubes for largemouth bass and smallmouth bass. Fishing was good using shrimp, cut bait and chicken liver for catfish. We had no reports on other species. The surface water temp was in the low 60s. Costilla Creek: Stream flow on Monday morning below Costilla Dam was .44 cfs. Mark your calendar to check this one out next spring. Eagle Nest Lake: Fishing was good using worms, PowerBait and small jigs for perch. Fishing was good using worms, PowerBait, Fire Balls, Pistol Petes and spinners for rainbow trout up to 24 inches. Fishing was good using large streamers, crank baits and in line spinners for northern pike. Kokanee snagging was slow with just two reported snagged in the dam area. One report came in that you could see salmon spawning near an island formed by the low water conditions. We had no reports on other species. Eagle Rock Lake: Fishing was fair using PowerBait, Fire Balls, small spoons and Pistol Petes for trout. Fawn Lake: Trout fishing was slow. Gallinas River: Fishing was fair to good using worms for trout. Lake Maloya: Fishing was very good using copper John Barrs, hare’s ears, Pistol Petes, PowerBait and salmon eggs for trout up to 18 inches. Maxwell Lake 13: We had no reports from anglers this week. Closes for the season October 31. Monastery Lake: Fishing was fair to good using Walt’s worms, prince nymphs, wooly buggers, PowerBait and earth worms for trout. Pecos River: Stream flow near the town of Pecos on Monday morning was 27.6 cfs. Fishing was very good using worms, Fire Balls and a variety of nymphs for brown and rainbow trout. Antonio Gallegos reported great fishing this past Sunday. He caught several rainbow and browns while using a size 16 bead head prince nymph with a size 16 hare’s ear trailer. Red River: Stream flow below the hatchery on Monday morning was 46.7 cfs. Trout fishing was fair to good using prince nymphs, bead head pheasant tails, wooly buggers, Fire Balls, PowerBait and worms. Fishing at the hatchery pond was good using PowerBait and worms. Rio Grande: Stream flow on Monday morning at the Taos Junction Bridge was 159 cfs. Trout fishing was very good using prince nymphs, bead head hare’s ears, pheasant tails, copper John Barrs, small Kastmasters, PowerBait and night crawlers. We had no reports on other species. Rio Hondo: Stream flow on Monday morning near Valdez was 9.60 cfs. We had no reports from anglers this week. Rio Mora: Stream flow near Terrero on Monday morning was 9.38 cfs. Fishing was good using worms for trout. Rio Pueblo: Stream flow near Penasco on Monday morning was 11.3 cfs. Fishing was good using salmon eggs and worms for trout. Santa Cruz Reservoir: Fishing was slow for all species. Storrie Lake: Fishing was fair to good using PowerBait for trout. We had no reports on other species. Fishing pressure was very light. Stubblefield Lake: The water was quite low and murky and fishing was slow for all species. Ute Lake: Fishing was good using senkos, creature baits, drop shot rigs and crank baits for largemouth bass and smallmouth bass. Fishing was fair using crank baits in the shallows and vertical jigging deep for walleye. Fishing was fair using slab spoons and blade baits at 32 to 45 feet for white bass. Fishing was good using cut bait and night crawlers for catfish. The surface water temp was in the low 60s. Abiquiu Lake: The lake level remains low and anglers should use extreme caution when launching boats. Four-wheel drive vehicles are recommended for launching. Much safer launching would be with canoes or kayaks. Fishing from the bank and from boats was slow to fair using crank baits and spoons for walleye and trout. We had no reports on other species. Animas River: Water flow below Aztec on Monday morning was 179 cfs. Trout fishing was fair to good using PowerBait, worms and salmon eggs. Bluewater Lake: Fishing was fair using large streamers, jerk baits, swim baits and crank baits for tiger muskie. A few catfish were caught by anglers using liver and hot dogs. We had no reports on other species. Canjilon Lakes: Trout fishing was fair to good using PowerBait, worms, Fire Balls, prince nymphs, copper John Barrs, Fisher Chick spinners and Daredevles. Chama River: Monday morning flows below El Vado and Abiquiu were 76.2 cfs and 274 cfs respectively. Trout fishing above and below El Vado was fair to good using hare’s ears, copper John Barrs, micro mays, worms and PowerBait for brown and rainbow trout up to 18 inches. Harry Howard reported good fishing below Abiquiu this past Saturday. They were drifting Berkley Power Eggs under a split shot. Cochiti Lake: Fishing was slow to fair using liver, hot dogs and night crawlers for catfish. We had no reports on other species. El Vado Lake: Fishing was slow to fair using worms and grubs for perch and smallmouth bass. We had a report of one kokanee snagged. Fishing pressure was light. Fenton Lake: Fishing was very good using gold Kastmasters, Super Dupers, Fire Balls, PowerBait and leech patterns for trout. Heron Lake: Fishing continued to be quite slow for all species with just a few trout caught by anglers using PowerBait and salmon eggs. Fishing pressure was light. Jemez Waters: Stream flow on the Jemez near the town of Jemez on Monday morning was 13.9 cfs. Trout fishing on the Jemez, Cebolla, Guadalupe, San Antonio and Cebolla was good using copper John Barrs, zebra midges, small prince nymphs, elk hair caddis, Fire Balls and worms for brown and rainbow trout. Laguna del Campo: Fishing was good using worms and small spinners for trout. Closes for the season October 31. Lake Farmington: Our only report this week came from Corwin Lameman who fished here one day last week. He fished for six hours and only caught one fish, a 12-inch white bass. He was using a trout magnet on a small jig with a small bullet weight. Navajo Lake: Fishing was very good using swim baits, jerk baits, crank baits, senkos, tubes, jigs and worms for smallmouth bass and largemouth bass. Fishing was good using spinnerbaits, jerk baits, swim baits, crank baits and jigs for northern pike. Fishing was fair to good using worms, tubes and grubs for perch. Kokanee snagging was slow. Leroy Apodaca reported that they tried for four days with no luck. We had no reports on other species. Designated no-wake areas are closed from October 1 through November 8. San Juan River: Stream flow below Navajo Lake on Monday morning was 392 cfs. Fishing was good using dead chickens, RS2s, fore and afts, dark colored midges, midge clusters and Root Beers for brown and rainbow trout. Through the bait waters, trout fishing was very good using worms, PowerBait copper John Barrs, dead chickens and small gold spoons. Alizabeth Butler of Fort Sumner reported good fishing over the weekend. She and a group of five others were fishing at the pump house area and caught 15 to 20 rainbow trout using worms and PowerBait. Her big fish was a 17-inch rainbow caught on worms. Seven Springs Brood Pond: Fishing was very good using PowerBait, Fire Balls, worms and leach patterns for trout. Tingley Beach: Fishing was good using PowerBait, Fire Balls and worms for trout. Fishing for all other species was slow. Bear Canyon Lake: Fishing was good using PowerBait, salmon eggs and small spinners for trout. A few catfish were caught by anglers using chicken liver. We had no reports on other species. Bill Evans Lake: Fishing was good using PowerBait for trout. We had no reports on other species. Elephant Butte Lake: Fishing was fair to good using spoons, crank baits, minnows, curly tail grubs and blade baits for white bass. Fishing was fair to good using crank baits, creature baits, senkos, worms, swim baits and spinnerbaits for largemouth bass and smallmouth bass. Fishing was good using chicken liver, night crawlers and cut bait for catfish. We had no reports on other species. Gila River: Stream flow on Monday morning was 109 cfs. Fishing was fair to good using small copper John Barrs and midge patterns for trout. Fishing was fair using wooly buggers and worms for smallmouth bass. We had no reports on other species. Glenwood Pond: Fishing was very good using PowerBait and Fire Balls for trout. Lake Roberts: Fishing was good using worms, salmon eggs and PowerBait for trout. We had no reports on other species. Percha Dam: Fishing was slow for all species. Rio Grande: Stream flow below Elephant Butte Monday morning was 0.10 cfs. We had no reports from anglers this week. Snow Lake: Fishing was fair to good using PowerBait for rainbow trout. Alto Lake: Fishing was fair to good using PowerBait, worms and salmon eggs for trout. A few trout were caught by anglers using Pistol Petes under a bubble. We had no reports on other species. Bataan Lake: Fishing was slow to fair using liver and worms for catfish. We had no reports on other species. Black River: Stream flow at Malaga on Monday morning was 13.4 cfs. We had no reports from anglers this week. Blue Hole Park Pond: Fishing was fair using PowerBait and Fire Balls for trout. We had no reports on other species. Bosque Redondo Lake: Fishing was slow for all species. Fishing pressure was light. Brantley Lake: Fishing was fair to good using senkos, crank baits, spinnerbaits, plastic worms and jigs for largemouth bass and white bass. Fishing was fair using liver and worms for catfish. We had no reports on other species. El Rito Creek: Fishing was good using PowerBait and worms for trout. Grindstone Reservoir: Fishing was good using PowerBait, worms and Fire Balls for trout. Anglers using worms also caught a few small bass. We had no reports on other species. Lake Van: Fishing was slow with just one catfish reported by an angler using night crawlers. Oasis Park Lake: Fishing remained slow for all species. The park with support from the Friends of Oasis will hold their 25th Annual Kids Fishin’ Clinic on November 3 from 9 a.m. to 2 p.m. For more information, call the park office at (575) 356-5331. Ruidoso River: Stream flow on Monday morning at Hollywood was 7.97 cfs. Fishing was slow to fair using worms and salmon eggs for trout. Sumner Lake: Fishing was fair using senkos, tubes, crank baits and spinnerbaits for largemouth bass and smallmouth bass. We had no reports on other species.